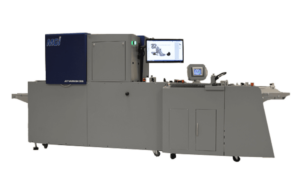 Delivering dynamic performance for the most demanding applications, the MGI JETvarnish 3D Evolution Spot UV Embossing and Hot Foil Stamping System gives extra added value and sensory dimensional textures to printed output. 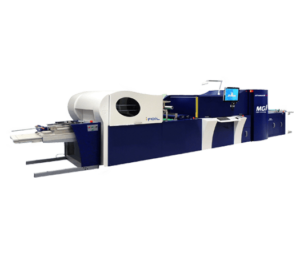 The MGI JETvarnish 3DS Spot UV Coater can help you attract new prospects and realize lucrative market opportunities by providing customers with ultra-precise spot UV coating. 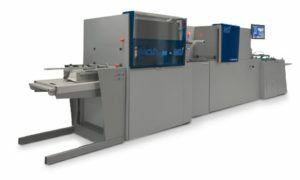 The MGI iFOIL S Digital In-line Embossing and Hot Foil Stamping System helps complement your MGI JETvarnish 3DS with inline embossing and hot foil stamping through a 100 percent digital process. 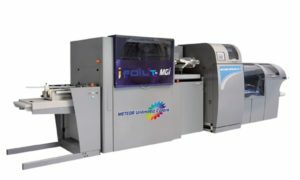 The MGI Meteor XL Plus 4-color Digital Press is fully integrated with the award-winning iFOIL Technology featuring a process that creates the Meteor Unlimited Colors XL Plus in-line printing and foiling solution.